STATEN ISLAND, N.Y. — Here is a look at what some of Staten Island's lawmakers have been up to recently. Gov. Andrew Cuomo this week announced the beginning of the suspension process for 575 New York-registered vehicles as part of the state's crackdown on persistent toll violators. These vehicles are alleged to have violated the recently adopted state regulations targeting individuals who fail to pay tolls, fees and other charges resulting from five toll violations on different days over an 18-month period. The regulation applies to all New York toll crossings. "These scofflaws operate at the expense of law abiding toll payers and put additional stress on New York's transportation network without providing any resources to maintain it," Cuomo said. "This administration's action stops these toll evaders in their tracks and sends a simple message: If you don't pay your fair share, you will be held accountable." The new state regulations went into effect Jan. 20. Prior to the suspensions taking effect, the Department of Motor Vehicles sends letters notifying owners that their vehicle registrations will be suspended within 45 days unless they pay the specified charges, or unless they contact the E-ZPass New York Customer Service Center to resolve the charges, or contact the Department of Motor Vehicles to request a hearing. On Monday, Assemblyman Michael Cusick (D-Mid-Island) announced that the Assembly passed his legislation to add a "check-off" box to the New York State income tax return form to encourage New Yorkers to contribute to research for various blood diseases. This legislation would lead to the increased availability of funding for the research, education and treatment of certain blood diseases. "Leukemia, Lymphoma, & Myeloma are deadly cancers which affect tens of thousands of men and women across our state and nation each year" said Cusick. "The inclusion of these 'check-off' boxes on our state income tax return form is a simple way to encourage our fellow New Yorkers to consider contributing to aid the research & treatment efforts to combat these horrible illnesses." Another provision in the legislation would empower the state health commissioner to accept grants, develop and implement programs concerning blood diseases and enter into contracts for further research. 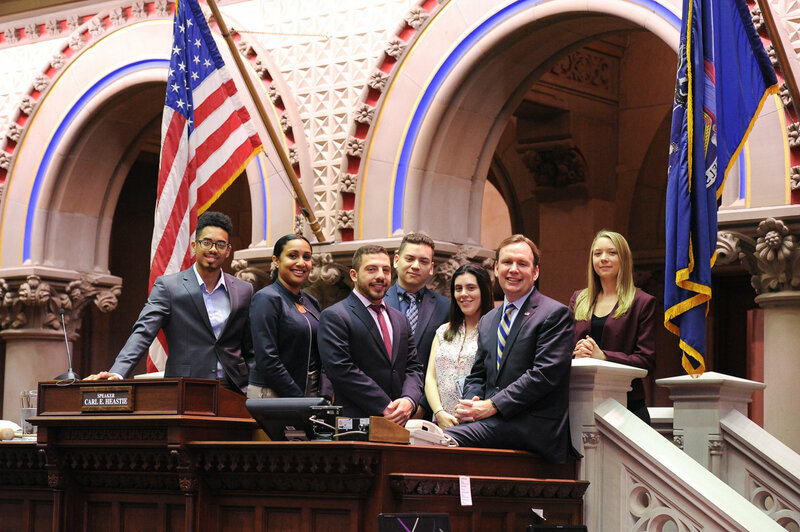 Cusick recently met with a group of Staten Islanders who are finishing their term in Albany as interns for members of the State Legislature. "The Albany internship program gives our young people interested in government the chance to experience it firsthand," said Cusick, adding that it always gives him "great pride" to Staten Islanders as a part of the program. Through the internship program, students learned how state government operates and participated in a "mock session," where they sat in the Assembly Chamber to debate and vote on legislation.